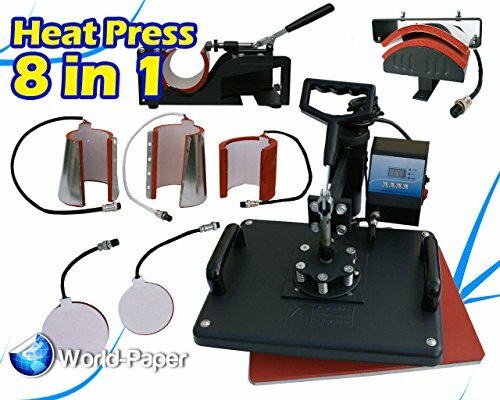 8 in 1 Heat Press Machine for t shirts machine combo kit swing away sublimation = 4 PCS mug press pad (different size) + 1 set cap press pad + 1 set flat T-shirt press pad + 2 PCS plate press machine. In another way, the material of our combo is full aluminum alloy, not the common iron as the old one, so it can be used longer and will not rust. As the multi-functional heat press, it is nicer and convenient for user, so it should be the best choice. This Multi-Function Heat Press comes with a 15" x 12" flat heat platen, our most popular size for transferring all standard heat transfer materials. In addition to the flat heat platen you also receive a cap heat platen for all your youth caps and your adult hats. This heat press also includes 5" and 6" ceramic plate heating elements which can adapt to all of your sublimation plates. You won't have any trouble transferring images to mugs of different shapes and sizes, as this package includes a standard 11-15oz. mug heating element, an espresso mug heating element, and a medium and large latte mug heating element which can also be used for your tapered pint glasses! Lower pressure Die Casting Heating element ensure no cold spots. 5.3/4" thick non-stick Teflon coated upper heat platen. T-shirts, cups and hats are NOT included. If you have any questions about this product by world paper 8 in 1 heat press, contact us by completing and submitting the form below. If you are looking for a specif part number, please include it with your message. Iglobalbuy 8in1 T-shirt Digital Heat Press Machine Transfer Sublimation Hat Mug Cap Plate 15" X 12"